High Gloss Spray Refinisher Energize PlusEnergize Plus is a ready-to-use spray buff/ burnish product that helps restore a beautiful wet-look gloss to floors. A unique blend of polymers, waxes, and solvents help enhance burnish response. Simply apply a light spray onto the fl oor and burnish immediately until dry.SoilShieldTM cleans up CompetitionDirt is the natural enemy of high gloss-high traf-fic floors causing discoloration and dingy appear-ance over time. SoilShieldTM is exclusive technology that makes Energize Plus less compatible with dirt. SoilShieldTM means fl oors clean-up better and look brighter for longer periods of time.Designed for SpeedEnergize Plus is designed for use in high or ultra high speed maintenance programs to improve appearance and enhance burnishing productivity. The product is particularly well suited for use with cord-electric burnishers. Also, Energize Plus may be used with lowspeed buffi ng equipment.RTU ConvenienceA single quart of Energize Plus will cover up to 25,000 sq. ft. Simply insert a sprayer into the bottle and you are ready to go. Spray a small amount onto the floor then burnish. Energize Plus is a ready-to-use spray buff/ burnish product that helps restore a beautiful wet-look gloss to floors. A unique blend of polymers, waxes, and solvents help enhance burnish response. Simply apply a light spray onto the fl oor and burnish immediately until dry. Dirt is the natural enemy of high gloss-high traf-fic floors causing discoloration and dingy appear-ance over time. SoilShieldTM is exclusive technology that makes Energize Plus less compatible with dirt. SoilShieldTM means fl oors clean-up better and look brighter for longer periods of time. 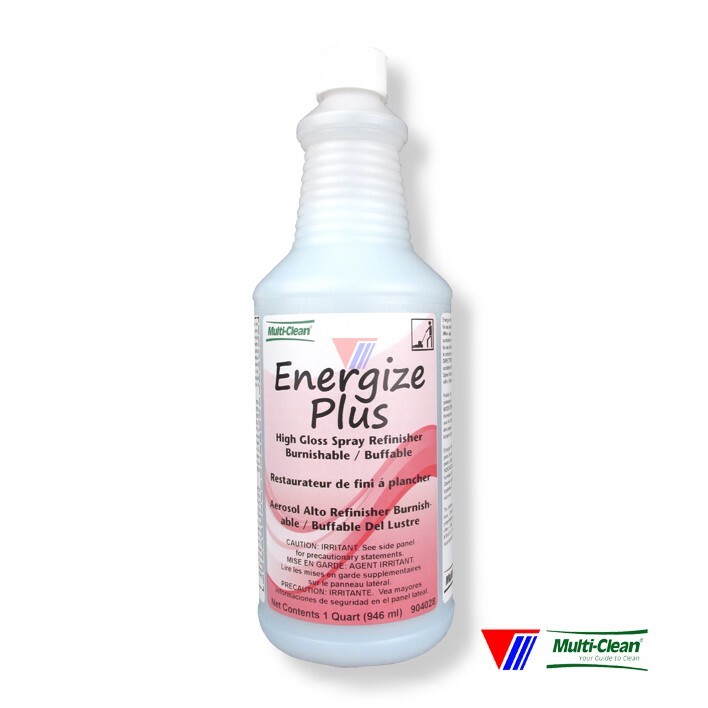 A single quart of Energize Plus will cover up to 25,000 sq. ft. Simply insert a sprayer into the bottle and you are ready to go. Spray a small amount onto the floor then burnish.